You need to make sure that your Aspire e cig is powered well – what better way than with an official Aspire e cig battery? All of our batteries are of a high quality and are made to be long lasting for all of our customers. These batteries, such as our Aspire K3 battery and our Aspire K4 battery, can power your e cig for many hours - or even days, depending on the model. Here at Aspire, we understand that it’s nice to have a little choice – particularly when choosing your battery. This is why we offer batteries in different colours. Aside from our standard batteries, our Aspire batteries come in two different colours to suit the rest of you're cig. These colours currently consist of black or vibrant pink. Our EXTERNAL battery cells range includes:. These batteries are rechargeable and are designed to power the best e-cigs around. These batteries are manufactured to fit their respective ecig kits, including the Aspire K2, K3 and K4. Refrain from leaving your Aspire e cig battery to charge unattended – if you are present you are more likely to prevent a hazard before one occurs. Do not charge an Aspire e cig battery with an Aspire charger that is of a high power current – this can lead to damaging your Aspire e cig. Refrain from charging your Aspire e cig battery overnight – this could potentially lead to a fire hazard. For further information on our Aspire e cig battery range, please feel free to contact us today by calling 0333 577 5002 (local rates apply) or email admin@officialaspire.co.uk. Aspire K2 Battery UK Spares Replacement battery for the Aspire K2 Kit. High quality fixed vol.. Aspire 18650 2600 mAh battery Any Mod is only as good as the batteries that power them and Aspire.. 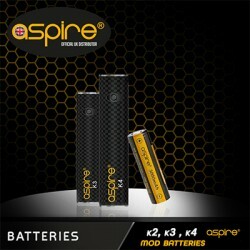 Aspire 26650 4300mAh battery IN STOCK NOW Any Mod is only as good as the batteries that power ..